With Christmas right around the corner, dinner is the last thing on my mind. Dinner is usually a stir-fry. You just throw everything into a pan and cook it. No stress. 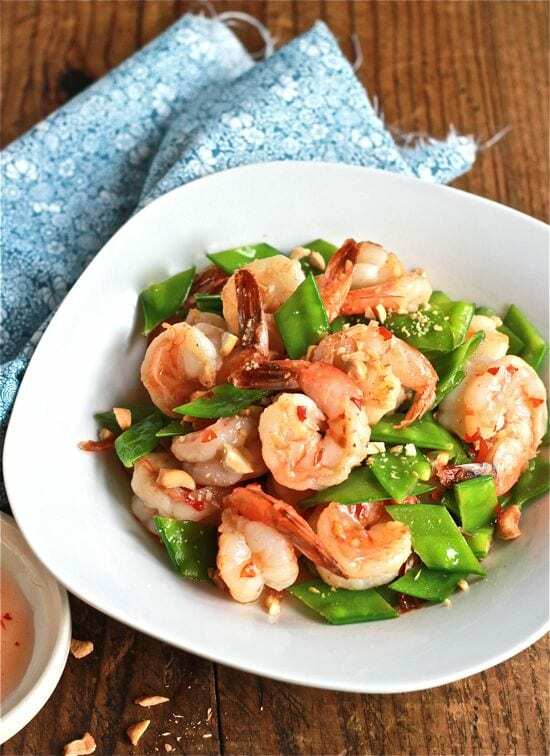 I like this particular recipe as the shrimp and snow peas cook up in a matter of minutes. Purchase already cleaned and deveined shrimp (frozen works too). This is a huge time saver. Use a microplane to ‘zest’ your garlic. This is a great trick for when you’re too lazy to chop and/or don’t want to stink up the cutting board. Cook in batches. Overcrowding the pan will make your stir-fry soggy. Simplify your ingredients (i.e. don’t add a million things…) This minimizes your prep, which means dinner is on the table in no time. So, if you find yourself knee-deep in Christmas lights and can’t be bothered with dinner, try making a stir-fry. It’s quick and easy, and a lot cheaper than ordering in. Add the shrimp and saute until pink and cooked though, about 5 minutes depending on size. Remove from the pan. 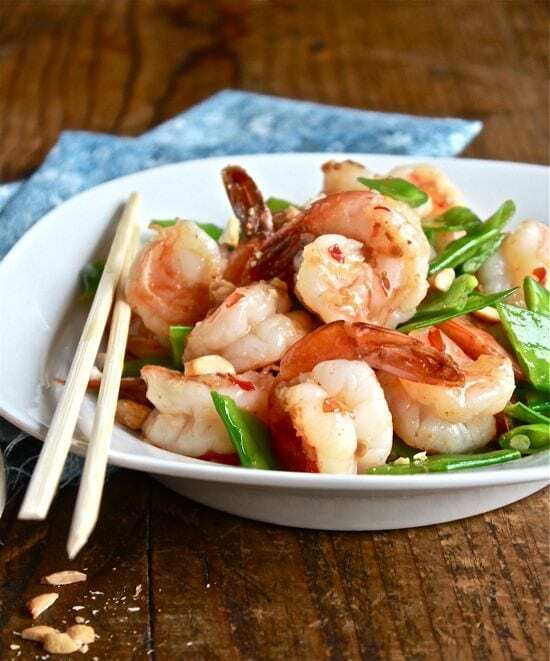 * If using frozen shrimp, make sure that they are defrosted before cooking. Pat dry with paper towels to remove any excess moisture. Just found your blog and LOVE it! I’ve been pinning recipes like crazy! Your photography is incredible- have you done a post with tips? ps- this recipe looks simply and delicious! I can’t wait to make this! 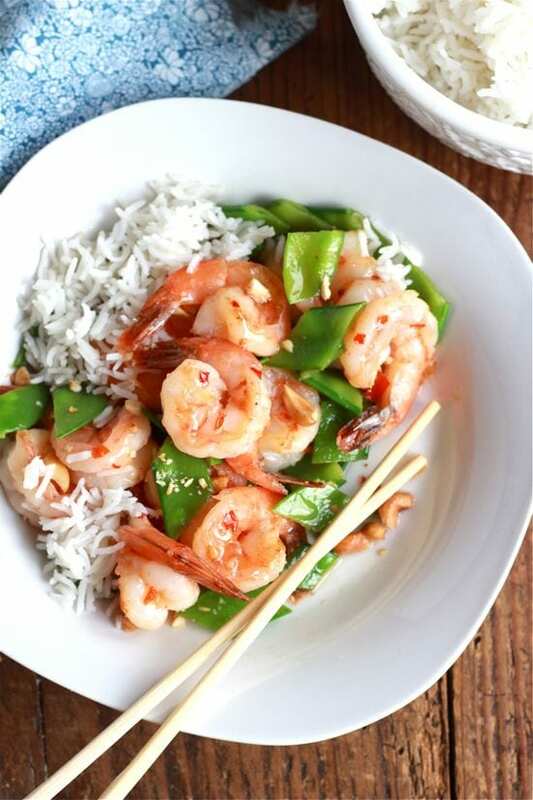 We love to make stir-frys here at home, and shrimp and snow peas are two of our favorite ingredients. Thanks for the great recipe, gorgeous photos as well! We love chili sauce. We use it instead of ketchup. This looks like a delicious stir fry. All I can say is DELICIOUS!!! What a lovely photo and recipe. Perfecto!